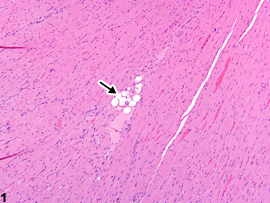 Heart, Myocardium - Vacuolation, Cytoplasmic in a female B6C3F1/N mouse from a subchronic study. 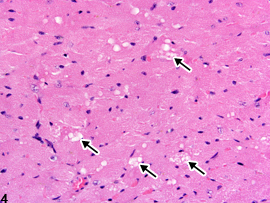 A focal area of cytoplasmic vacuolation of myofibers is present (arrow). 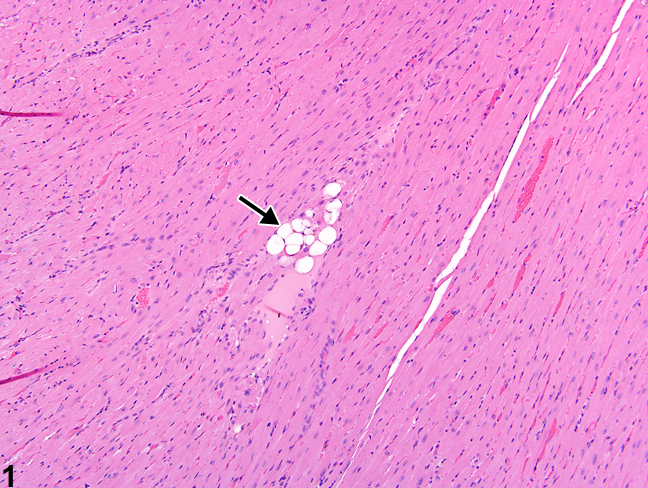 Heart, Myocardium - Vacuolation, Cytoplasmic in a female B6C3F1/N mouse from a subchronic study (higher magnification of Figure 1). Large intracytoplasmic vacuoles are present in a group of myofibers (arrows). Heart, Myocardium - Vacuolation, Cytoplasmic in a female B6C3F1/N mouse from a chronic study. 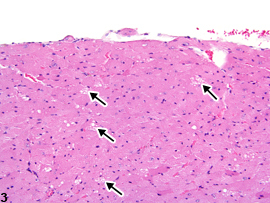 Multiple cardiac myocytes contain cytoplasmic vacuoles (arrows). 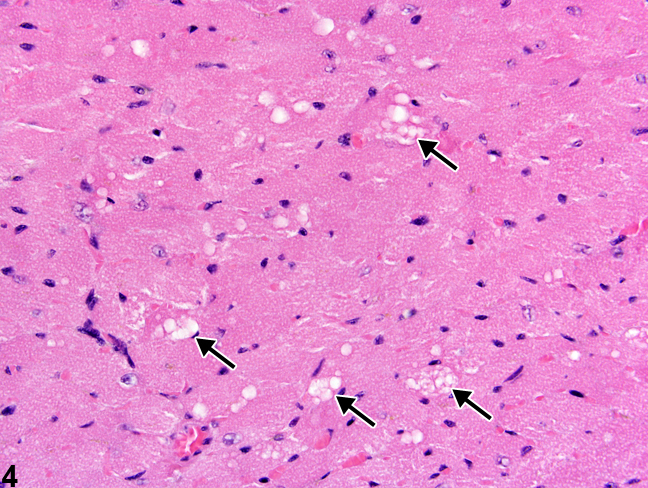 Heart, Myocardium - Vacuolation, Cytoplasmic in a female B6C3F1/N mouse from a chronic study (higher magnification of Figure 3). 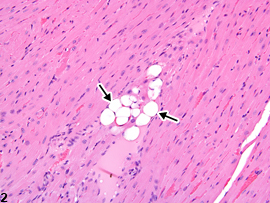 Some of the cardiac myocytes have variably sized vacuoles (arrows). due to disintegration of their outer membranes. In other cases, vacuolation forms from distension of the sarcoplasmic reticulum within cardiomyocytes. Electron microscopic examination may be used to positively identify the source and content of the vacuoles. 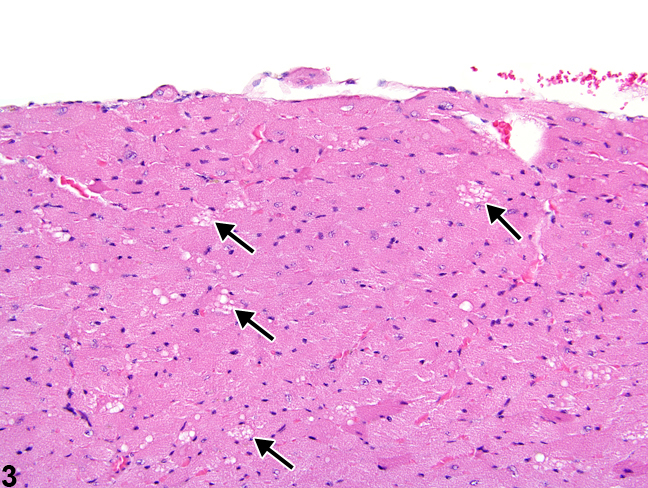 Cytoplasmic vacuolation of the cardiomyocytes should be diagnosed whenever present. It should be graded based on the extent of the lesion. The distribution of the vacuolation (i.e., focal, multifocal, or diffuse), as well as the location (i.e., right, left, or interventricular wall), should be described in the pathology narrative. If vacuolation is considered part of the spectrum of changes in cardiomyopathy, it should not be diagnosed separately but may be mentioned in the pathology narrative. Dunnick J, Johnson JA, Horton J, Nyska A. 2004. Bis(2-chloroethoxy)methane-induced mitochondrial and myofibrillar damage: Short-term time-course study. Toxicol Sci 81:243-252. Dunnick JK, Lieuallen W, Moyer C, Orzech D, Nyska A. 2004. Cardiac damage in rodents after exposure to bis(2-chloroethoxy)methane. Toxicol Pathol 32:309-317. Jokinen MP, Lieuallen WG, Johnson CL, Dunnick J, Nyska A. 2005. Characterization of spontaneous and chemically induced cardiac lesions in rodent model systems: The National Toxicology Program experience. Cardiovasc Toxicol 5:227-244. Rahman A, Kessler A, More N, Sikic B, Rowden G, Woolley P, Schein PS. 1980. Liposomal protection of adriamycin-induced cardiotoxicity in mice. Cancer Res 40(5):1532-1537. Schmitz FJ, Rosen P, Reinauer H. 1995. Improvement of myocardial function and metabolism in diabetic rats by the carnitine palmitoyl transferase inhibitor Etomoxir. Horm Metab Res 27(12):515-522.